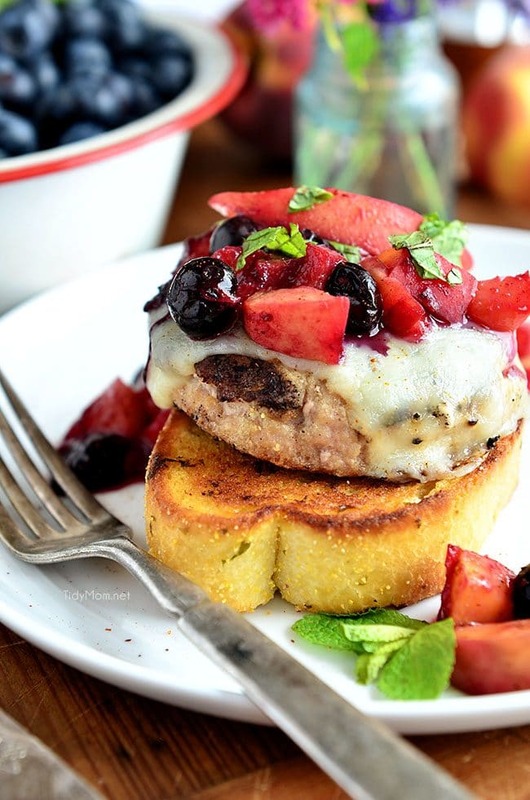 Dinner made easy with grilled turkey burgers topped with Monterey Jack cheese, peaches and blueberries on a thick slice of garlic toast – ready in about 20 minutes. You may remember, last summer I told you about my love of Butterball frozen turkey burgers. They are wonderful to have in the freezer because they go right from the freezer to grill (or skillet) and cook in under 20 minutes. Perfect for the nights when you’re in a hurry and or have not planned anything for dinner. When I got a little fancy and made Grilled Turkey Burger with Orange and Fig Glaze and Creamed Feta I thought I had died and gone to burger heaven. It’s still one of my all-time favorite burgers. So this year when Butterball asked if I’d like to see what else I could do with a turkey burger, I couldn’t resist. I knew it was going to be hard to top the orange and fig glaze and creamed feta, so I went another direction. Since I just love summer and ripe peaches, I wanted to try another turkey and fruit pairing. 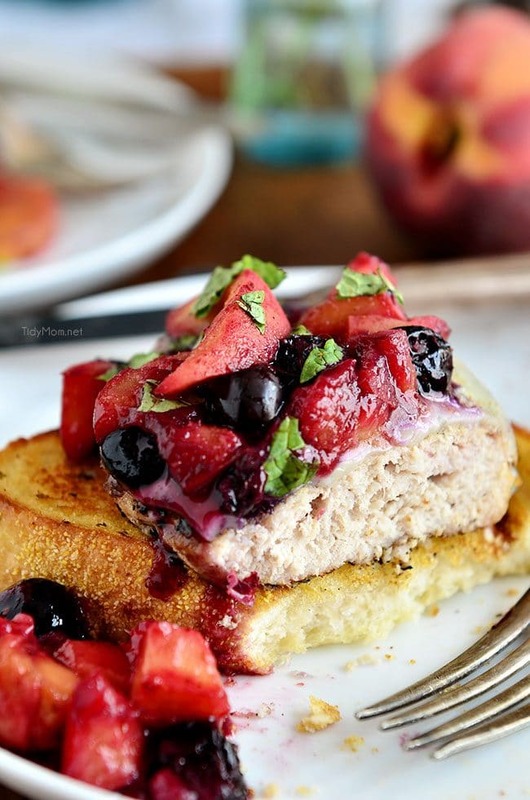 I made a Grilled Turkey Burger with Peaches and Blueberries served on a piece of garlic toast! Hold on to your hats, I know it sounds like an odd combination, but oh my word was it delicious!! Not only were we super happy with this grilled turkey burger……you’ll be happy too, because this burger is low fat, high protein, and max on flavor. Natural Inspirations White Turkey Burgers are 93% Lean, Gluten Free and filled with flavor. —the white meat is much lower in calories and fat and grilling the burgers makes for an added boost of flavor. 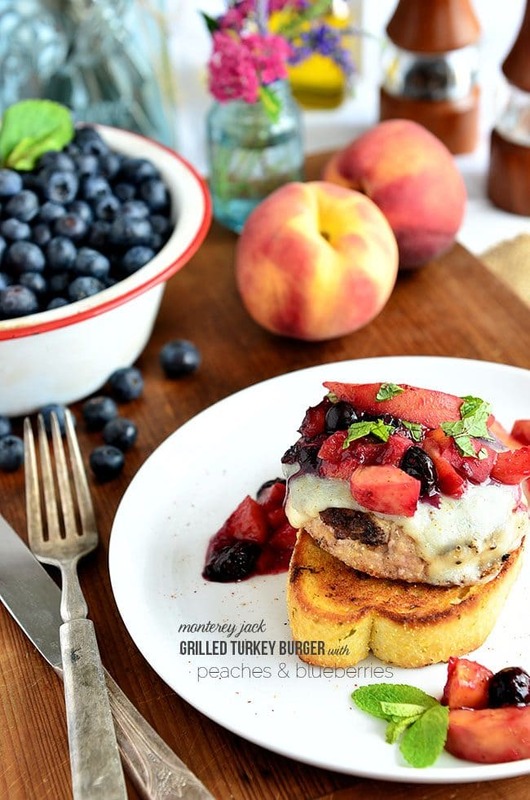 The juicy sweetness of the peaches and blueberries add a whole new dimension to the burger. A Turketarian is someone who believes that if you aren’t eating turkey, you are missing out. Turketarians love turkey as part of a healthy lifestyle, we crave the delicious flavor of turkey, and work it into family meals whenever possible. 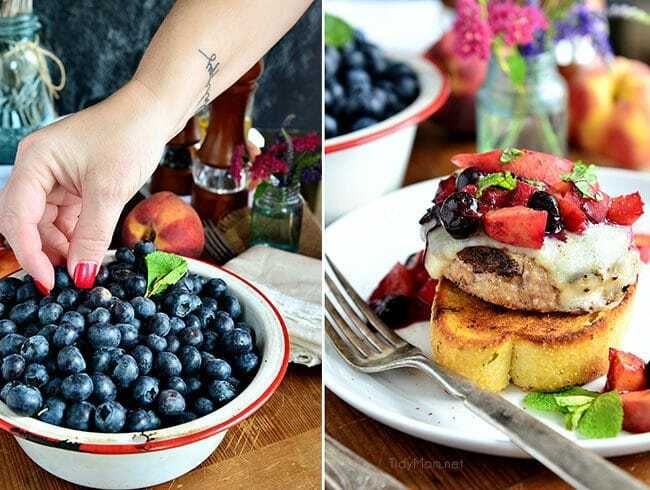 Butterball frozen turkey burgers make this summer meal quick and the peaches and blueberries add just a touch of sweet to the chili powder and garlic toast. Preheat grill to medium heat. Lightly brush both sides of FROZEN turkey burgers with olive oil and place on grill about 4-inch above heat. Grill burgers 8 minutes on one side. Turn and grill other side 7 minutes or until done and a meat thermometer inserted in center of burger registers 165°F. Add cheese; cover and cook 1 minute more. Meanwhile, in a large skillet combine peaches, blueberries, and chili powder. Cook, stirring occasionally, over medium heat for 5 to 6 minutes or until heated through and juices are beginning to form. Top each piece of garlic bread with one turkey burger and some of the peach mixture. If desired, top with mint and additional chili powder. Disclosure: I have a working relationship with Butterball, but as always, all views, opinions……and my family’s love of turkey are all my own. Thank you for supporting the brands that support TidyMom. Holy yum! I love how pretty this looks and the fact that I don’t have to make turkey burgers from scratch. So easy! 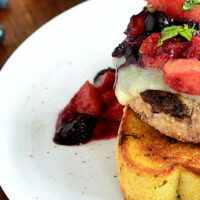 We love turkey burgers and always keep them stocked in the freezer! Such a healthy, protein-packed food to keep on hand. Love how you fancied them up!! OMG, this sounds so summery-fresh. Beautiful, Cheryl. Would love to create this at a fun summer barbecue! 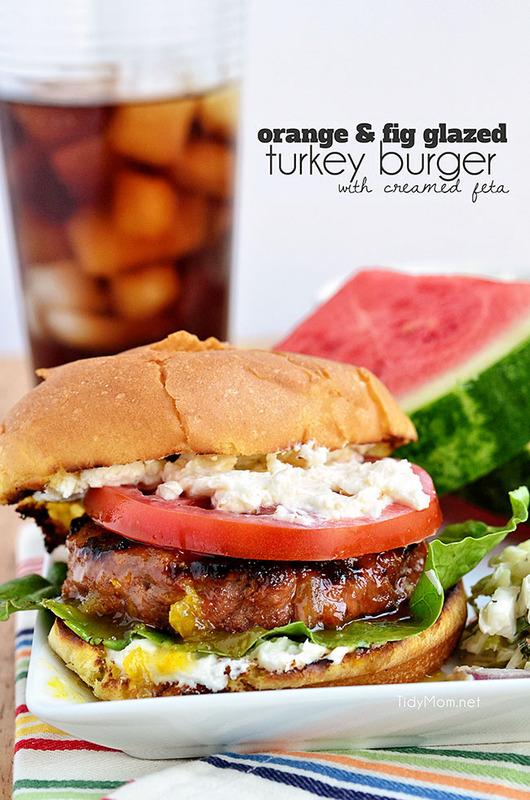 This summer relish is so beautiful on this burger!! And I have blueberries to spare with my last picking! Woot! What a creative, delicious looking burger. Count us in as turketarians too 🙂 Seriously though, that burger. It’s all I can think about. Good thing I have some frozen butterball turkey burgers in my freezer! I never would have thought to put fruit like that on my turkey burger. 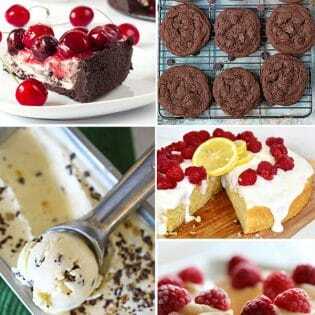 Guess I need to make some soon and try it! We love turkey burgers but definitely agree they usually need some added flavors in forms of toppings. Using fruit is such a creative idea, we bet it tastes great! Do you recommend any other fresh fruit that would work well? You always take the most amazing photos. I always feel like I’m sitting in your house visiting while I read your blog. That says so much about how welcoming your writing and photos are.